Backsplash is usually the last piece of a kitchen design, or the first consideration for a kitchen upgrade to add value to your home. The space between the kitchen counters and cabinets needs a durable wall covering to help protect it from water and grease, and also to make cleaning easier. 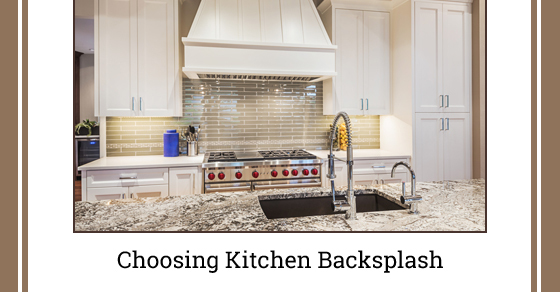 There are many different materials that can be used for your backsplash, so the selection is mostly influenced by your personal preferences. Whether refined, funky, neutral, or loud, the design and material you choose should showcase the theme and colour scheme of your kitchen. The backsplash is a personality piece, and a focal point. Search for kitchen backsplash at a home hardware store, and you will see the large variety of colours and styles that come up, so all you have to do is pick a material with desirable properties or mix and match the materials to achieve a certain effect. It is easy to maintain, though it is expensive, plus it scratches and dents. You can try mixing different colours, designs, and metals, like brushed stainless steel tiles with oil-rubbed bronze or antique brass. Available in a very wide selection of colours, textures, and finishes, and you can also obtain unique art pieces. It requires regular cleaning and sealing in order to provide long service. This is a very popular material due to its wide variety of colours and reflective properties. It has remarkable stain resistance properties, though it can be scratched. A beautiful, low-maintenance, and porous material that absorbs dirt and grease. A beautiful and long-lasting material with low maintenance. To protect it from moisture, homeowners should reseal it twice a year. Depending on the theme of your kitchen, you can choose to go with either a traditional or contemporary theme, but the colour scheme, style, and materials should not keep you from fulfilling the primary purpose of the backsplash: to protect the walls from stains. Consider how much work you need to put into maintaining your kitchen backsplash tiles, and ask yourself: will the metal or glass be easily scratched by abrasives? How often do you need to apply sealants to protect the porous material? Will it be easy to clean those decorative tile pieces with many grooves and protrusions? If you are keen to follow kitchen backsplash trends, you might have heard that backsplash installation is one of the top DIY projects among homeowners looking to increase the value of their property. While the installation may be relatively straightforward, your kitchen backsplash is a focal point, so you may want to consult a professional designer to ensure it is installed properly. They can help you remove old material and repair the underneath surface, direct you to the best materials that complement your kitchen style, and help you coordinate colours, sheens, and shapes. Lastly, you should try to maintain flexibility if you are working on a budget, as you may have to compromise on style, texture, or materials to avoid breaking the bank.